Come join us for a day on the links! 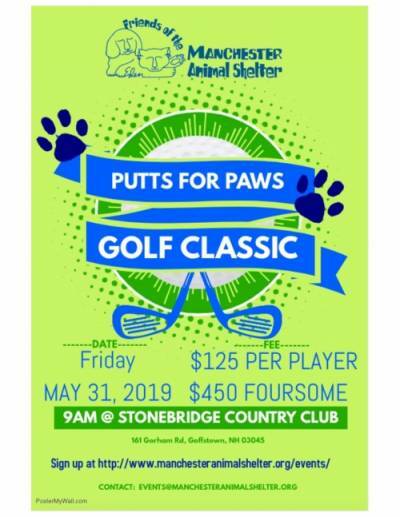 On Friday, May 31st we will be hosting our Putts for Paws Golf Classic at the gorgeous Stonebridge Country Club in Goffstown, NH. Your donation will be rewarded with 18 holes greens fees, a cart, lunch and the ability to participate in lots of amazing raffles and contests! $125 for a single registration or $450 for a foursome. Grab your friends and come out for a day of fun, supporting a great cause! Manchester Animal Shelter is the home to Manchester's abandoned, abused and stray animals. All monies raised will help us in furthering our mission of "giving animals a better tomorrow." We hope to see you out on the course!